Vincent van Gogh only sold two paintings while he was alive. Now, he is considered one of the best and most important painters. 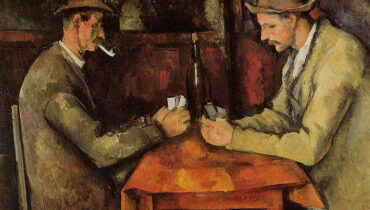 Most of his work is preserved and can be found in the Van Gogh Museum in Amsterdam, the Netherland. 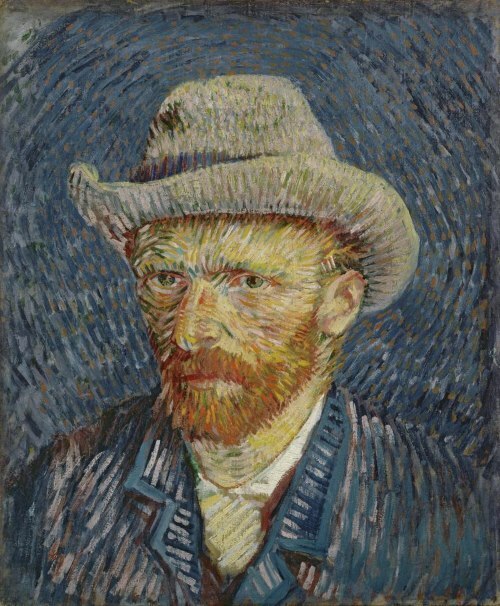 Van Gogh painted a great many self-portraits during his life, claiming that he had deliberately bought an excellent quality mirror as he despaired of having suitable models from which to work. The brush-strokes centre the picture on the artist’s eyes, and the work is, as often is the case with Van Gogh’s works, painted on the reverse side of another work. 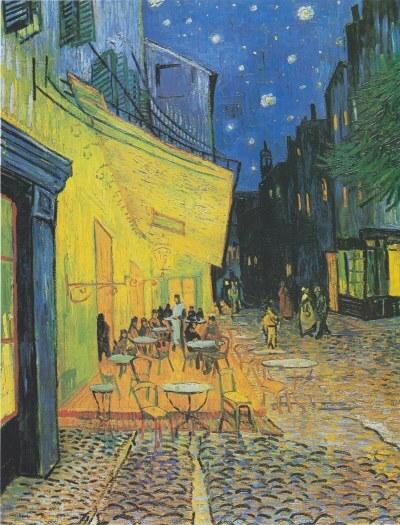 This work is also known as the Café Terrace at Night, and was painted as the artist felt that the scene before him was strongly reminiscent of a scene in a book by Guy de Maupassant. This painting was the first time that Van Gogh attempted to paint a starry sky, something that he repeated with great success in ‘Starry Night over the Rhone’ which is best known now as simply ‘Starry Night’. Interestingly, the scene painted by Van Gogh, in September 1888, can still be seen today and is mostly unchanged, with just modern lighting and tourist crowds to highlight the passing of time. The café is known as Café Van Gogh. 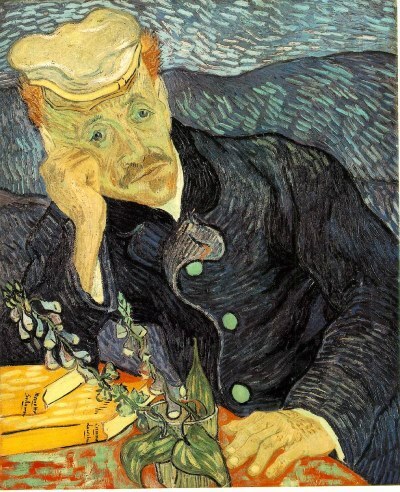 Dr Gachet was Van Gogh’s doctor and his saddened expression could be explained somewhat by the knowledge that both versions of the painting (essentially the same subject in the same pose, but with very different colouration) were painted just one month before the artist died. (Van Gogh himself, felt that Dr Gachet could not help him at all, seeing in the doctor a kindred spirit, both mentally and physically.) The first version sold in 1990 for US$82.5 million, making it, with inflation accounted for, the most expensive painting ever sold at public auction. 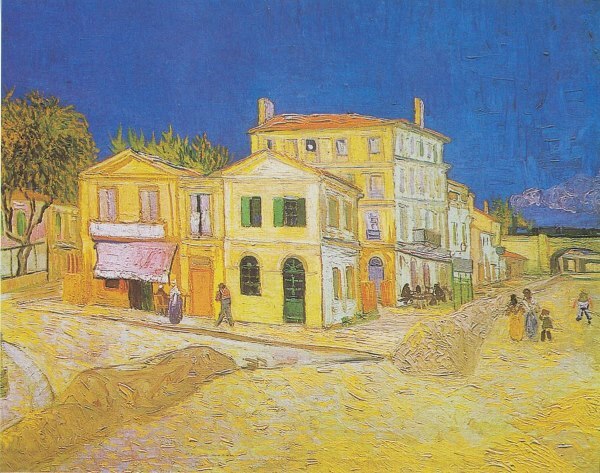 The Yellow House is based upon premises where Van Gogh took rooms for a time and is, interestingly enough, where the artist Paul Gaugin had lived for a while, sometime earlier. The house was damaged during the Second World War and was later demolished. 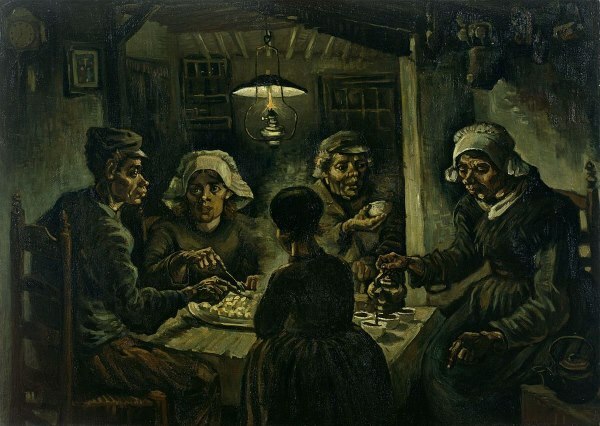 The painting was never sold and remains the property of Vincent Van Gogh Foundation, although it is on permanent loan to the Van Gogh Museum in Amsterdam. This charming, almost cartoon style depiction of a bedroom is appealing for its captured innocence. 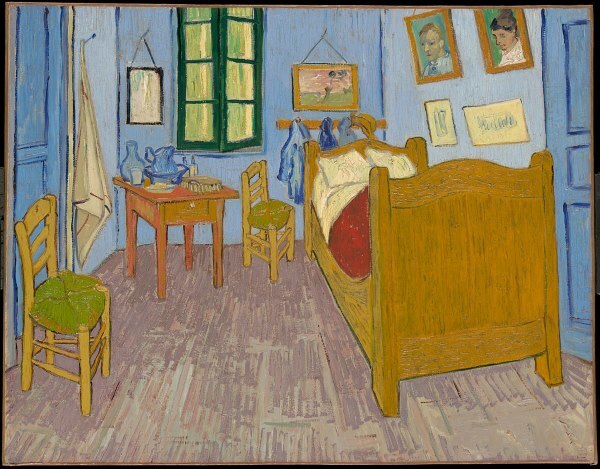 The bedroom in question was Van Gogh’s and was not rectangular but more trapezoidal with an awkward angle in one corner – something that Van Gogh did not deem worthy of precise depiction! There are three versions of the painting: the second because the first has sustained water damage and the third because Van Gogh decided to recreate some of his favourite works in smaller editions. As often with Van Gogh’s paintings, when he liked something he really liked it and used it frequently in his work – and he seems to have very much liked sunflowers! While many people know of at least one Van Gogh featuring sunflowers, many of them think of it as his only work featuring the cheerful yellow flowers. Instead, it is the work known as ‘Still Life: Vase with Fifteen Sunflowers’ that is best known for its enormous selling price. 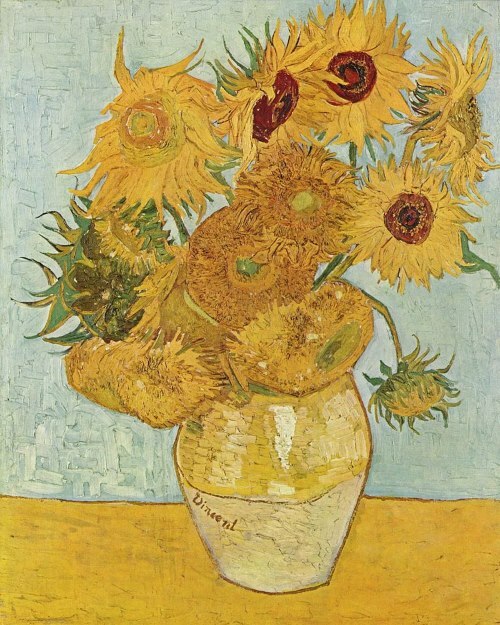 This painting is just one of a series of around thirteen painting of sunflowers alone, and Van Gogh often included sunflowers in still life paintings of other flowers and fruits. 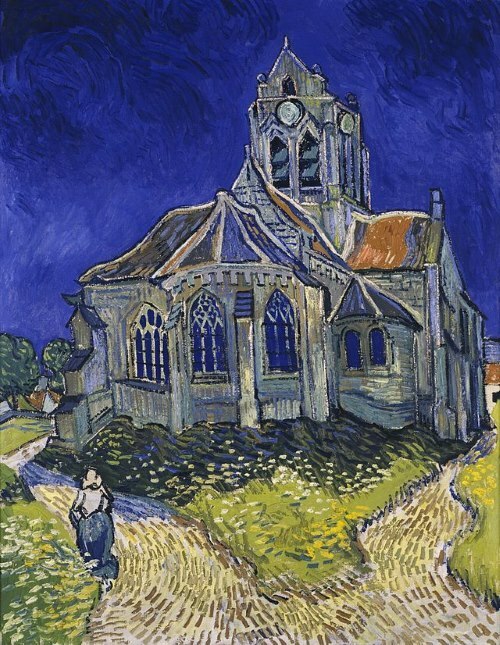 Van Gogh, in his last few weeks, seemed to betray a certain nostalgia for the region of his youth and this painting, a depiction of an actual church in Auvers-sur-Oise is one of that series. 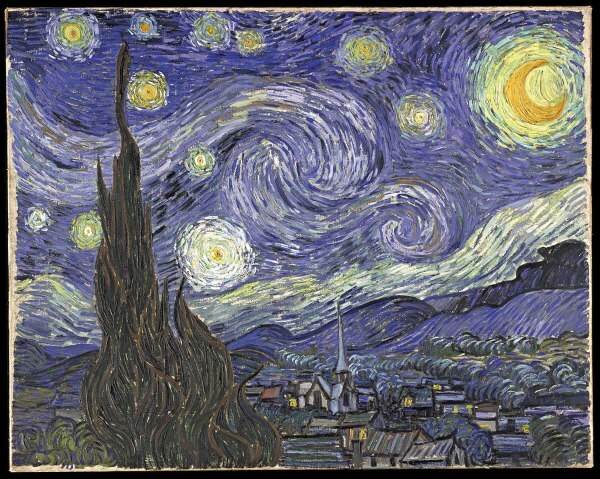 Van Gogh’s vibrant use of colour and the striking attraction of the painting has seen it being used in an episode of the sci-fi drama Doctor Who as the home of a krafayis (a strange creature similar to a griffin). Van Gogh painted this earthy rustic scene with the express aim of making the viewer think about what they were seeing. He chose homely models and desired to make it appear as though the diners had obtained their dinner through effort and work, portraying, so he hoped, the ‘peasants’ as they really were. He did not want people to automatically nod and approve of the painting as something pretty and superficial. Even two years after the painting was complete, Van Gogh felt it was the best work he had ever done and he was very hurt when a contemporary of his, Anthon Van Rappard, criticised the piece. 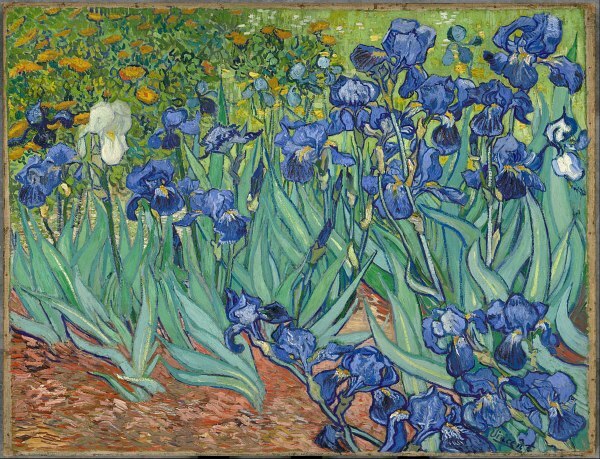 The Irises was painted while Van Gogh was already living in an asylum, but before he had his first major attack of illness. He said, of the painting, that working on it kept him sane, delaying the onset of that first bout of insanity. The painting is surprisingly serene, lacking the high tension that marks many of his works, especially the later ones, featuring a lively growth of predominantly blue irises with one or two white ones fighting through. The flowers are outlined with strong strokes of colour, lending the painting a charming air of stylized caricature. Van Gogh did not have to walk far from his lodgings in the Yellow House to find inspiration for, arguably, his best known painting. Just one minute walk from the house, Van Gogh saw bright starlight and the lights from the quay reflecting in the water of the Rhone. Use of colour was always important to Van Gogh, and this was not neglected in these pictures of night time and in his efforts to capture the feeling of both starlight and the new-fangled artificial lighting that was sweeping the modern world at that time. Uniquely, Van Gogh did not paint the stars as single points of light, giving them generous haloes and showing the Milky Way as a broad swirling sweep of light. His distinctive brush strokes and lavish thickness of paint combine to create an unrealistic landscape that, even so, speaks to the explorer in all of us.